"Today, we're going to show you the third leg of our device business strategy," Jeff Bezos begins. His audience is modest: four people sitting around a table in an Amazon conference room. It's a far cry from the Santa Monica airplane hangar his company rented out for last year's event. Bezos picks up a dry erase marker and begins breaking down the first two parts, elements the company has focused on since it first began building Kindles. "One," he says, narrating the words as he goes along, like an enthusiastic high school teacher, "premium products at non-premium prices. Two: make money when people use our devices, not when they buy our devices." 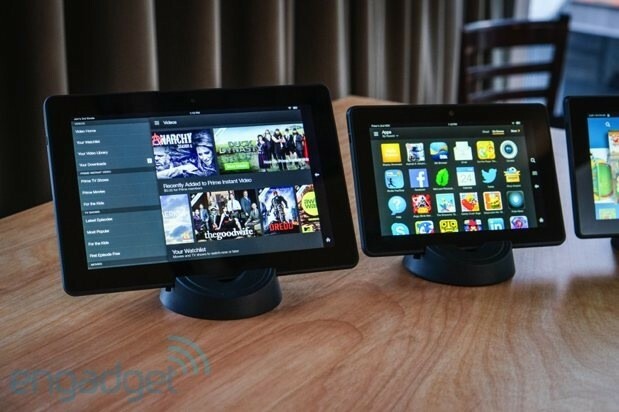 "We sell our hardware and roughly break even and then when they use the devices and buy content," he adds. "Our point of view is that this is more aligned with the customer. We don't have to get discouraged when we see people using fourth-generation Kindles. Bezos draws a Venn diagram to illustrate the third part of the puzzle. He writes "customer delight" on one side and "deep integration throughout the entire stack" on the other. The intersection houses the "hardest" and "coolest things," which utilize OS, key apps, the hardware stack and the cloud. "It's a little abstract," he adds, "but I think it will be extremely clear when I show it to you." 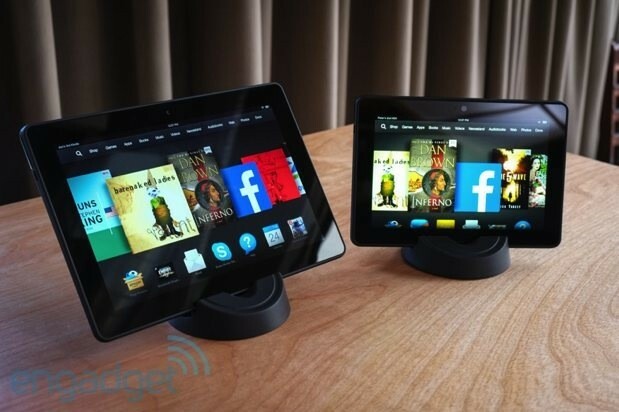 The template for the third piece of the puzzle is the new Kindle Fire HDX series -- the company's latest premium tablets. The slate, like its predecessor, comes in 7- and 8.9-inch configurations -- this time sporting much higher resolutions, with pixel densities rated at 323 pixels per inch (1,920 x 1,200) and 339 ppi (2,560 x 1,600), respectively. Compare that to 221 and 254 ppi for their predecessors and the 264 ppi on the iPad 3. For by-the-pool readers, there's also a dynamic image contrast feature, which one exec pulled out a flashlight to demo. The feature works by shifting the display's contrast, rather than brightness, to compensate for external changes in lighting. It's still not the perfect outdoor reading device some are hoping for, but, well, that's part of the reason the company's keeping its Kindle reader line around. 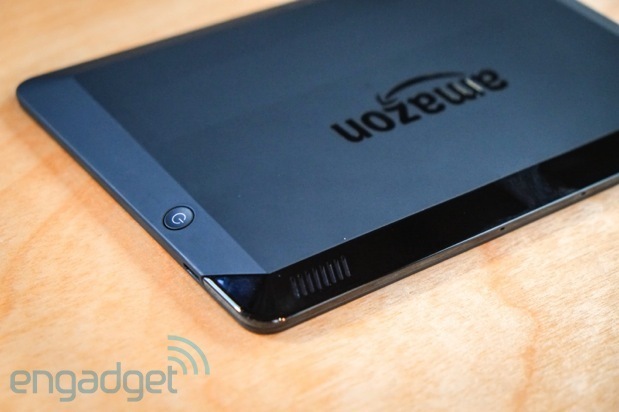 The body of the tablet matches up with a number of those leaks we've seen trickling out over the past couple of weeks. It's a more angular thing, trading last year's rounded edges for slanting slopes on the rear. The speakers have been moved from the center to the top of the devices, for the obvious reason of not letting your hands muffle the audio as you clutch tightly to it watching those final Breaking Bad episodes on Amazon Instant. On the left side of the back is a big volume rocker that'll play nicely with small hands, should you find yourself in the growing camp of users who share their tablet with their little ones. On the right side is a big, matching power button -- handy should you ever find yourself having to fire the slate up in the middle of the night to warn off intruders. What the pictures didn't tell us, however, was just how light the 8.9-inch version is. Amazon describes it as "startlingly so." Thankfully, we managed to stifle a shriek when we picked it up, but at 13.2 ounces, the word "surprisingly" does factor into the equation. It's nearly seven ounces (or 34 percent) lighter than its predecessor. Interestingly, there's only a single port on the HDX: micro-USB. There's no MHL or HDMI here. So, how do you actually get your video off the thing? We'll get into that below. As for cameras, the 7-incher only has the front-facing variety. The 8.9-incher's got two, including an 8-megapixel one on the back that shoots 1080p video. It also sports an LED flash and built-in electronic image stabilization. These guys are quick, too. Both versions feature a 2.2GHz quad-core Snapdragon 800 processor and twice the RAM as the last version, bringing the total allotment to 2GB. Put it next to 2012's model and you'll note a difference, even with something as simple as flipping through icons on the home screen or opening up a record. The difference in gaming is far, far more pronounced. 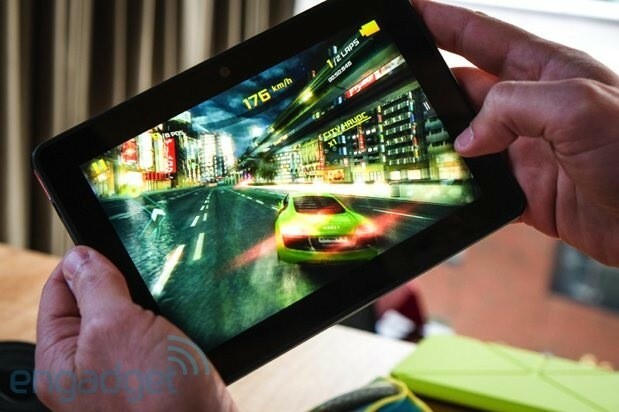 We took the HDX through a round of Asphalt 8: Airborne, and, thanks in part to the Adreno 330 graphic engine, it handled things with aplomb -- we can't, sadly, say the same about our accelerometer-based driving skills, unfortunately. Battery-wise, Amazon's promising 11 hours (one more than it listed for the previous 8.9 version). Flip into the special reading mode (not unlike the feature we saw on the last Kobo tablet) and you'll get up to 17 hours.